One of the pleasures that Elly brought home from her year in France was the tradition to sit with an aperitif and appetizers before beginning or sometimes during the preparation of the evening meal. The variety of nibbles are endless: Saucisson, olives, roasted peppers, hummus, tapenades or dipping oils with chunks of French sticks, triangles of pitta bread, melba toasts or crisps. Today I have two very different Dips for you. With a blender or food processor they are ready in seconds. Prick the aubergine all over and grill, turning frequently, until the skin is charred all over. Remove the skin, rinsing in cold water. Place the aubergine and all the other ingredients in a food processor and season to taste. Process until smooth, then transfer to a serving dish. Place the cheese and yoghurt in a food processor and blend for 30 seconds. Add the mashed bananas, chutney and lemon juice and process until smooth. Spoon into a serving dish. 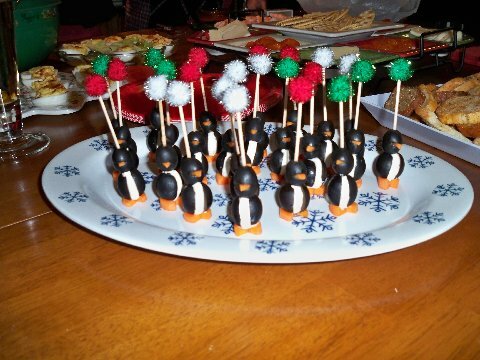 This entry was posted in Appetizers & Nibbles, recipes and tagged Baba Ghanoush, Banana Boat, Nibbles on June 20, 2011 by Grannymar. Mix the grated cheese and relish to make a thick paste. Spread the chopped parsley on a flat plate. Form the cheese mixture into 10-12 small balls. Roll in the chopped parsley, making sure that they are well coated. Place on a serving dish and spear with cocktail sticks. Chop the prawns finely, then mix in the cream cheese and lemon juice. Season to taste. Place the chopped nuts on a flat plate. Shape the prawn mixture into 16 small balls, then roll in the chopped nuts, making sure that they are well coated. Place on the serving dish and spear with cocktail sticks. 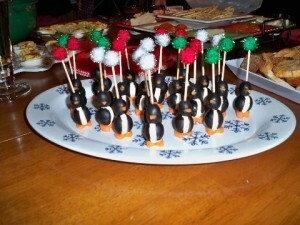 This entry was posted in Appetizers & Nibbles, recipes and tagged Cheese Balls, Nibbles on April 12, 2010 by Grannymar.